Indigenous communities denounce the contamination of the Cateté River by Vale, which produces nickel a few kilometers from the Xikrin do Cateté Indigenous Land in Pará. The Justice has ordered the interruption of operations in Onça Puma several times. In 2003, the Canadian mining company Canico Resource Corp., through its subsidiary Mineradora Onça Puma S.A., obtained the authorization to explore nickel reserves in the mountain range Serra da Onça, located in the municipality Ourilândia do Norte, by the Brazilian Mining Department. In the same year, the company requested to the National Institute of Colonization and Agrarian Reform (Incra) the appropriation of an area of 7,404.76 acres belonging to rural settlements Campos Altos and Tucum, where three thousand families lived since the early 1990s. According to Comissão Pastoral da Terra (CPT), after the acquisition of Canico by the mining company Vale (former CVRD), which occurred between 2005 and 2006, there was an increasing pressure on rural workers to sell off their land and accept the compensation offered by the mining company, which they considered considered insufficient instead. CPT and local leaders also said that these negotiations had taken place even before the authorization of Incra, which was a requirement for mineral exploration. That is, the acquisitions were carried out irregularly and illegally [1, 3, 4]. Between 2008 and 2011, in order to claim the payment of fair compensations, rural workers closed the road that gives access to the mine several times [1, 5, 7]. Despite the irregularities in the acquisition of land for the Onça Puma project, Vale obtained the mine's operating license in 2010 and, in the following year, began to extract and export nickel. The start of the Onça Puma operation, however, brought new problems to the region, especially to the Xikrin indigenous groups. The mine is adjacent to the indigenous land Xikrin do Cateté and nickel processing takes place less than six kilometers from there. Therefore, one of the conditions for the mine to be authorized was an evaluation of Funai (the National Indigenous Foundation) about the influence of Onça Puma on the indigenous population and the approval of an environmental impact mitigation plan to be initiated still in 2004 (when the previous license was obtained). In November 2005, Vale filed the final report of the Xikrin do Cateté ethnoecological study, but Funai delivered its evaluation only five years later, when Onça Puma was already in operation. Also, despite the fact that the mine entered into function normally, the compensatory and mitigating measures had not started. Based on these problems, the Federal Public Ministry filed a Public Civil Action in 2011, requiring Vale to comply with the environmental licensing requirements, mainly the ones related with the Xikrin and Kaiapó indigenous, to stop operations and to pay the due compensation [1, 2, 6]. 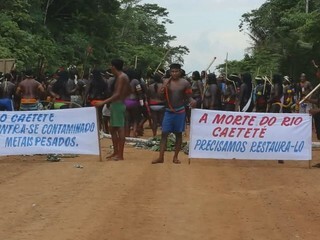 The Public Civil Action had important repercussions since 2015, also due to an even more serious suspicion that Onça Puma was contaminating the Cateté River, on which the indigenous groups depend for their survival. In 2015, indigenous associations asked a research group of the Federal University of Pará (UFPA), led by Professor Reginaldo Saboia, to monitor the quality of the river. They measured the presence of heavy metals in water, reaching levels above those recommended by the National Environment Council (Conama). The report corroborated the fact that the contamination was the cause for itchy skin and burning eyes felt by the indigenous peoples and for the decrease in the quantity and diversity of fish, registered since the Onça Puma began to operate. The accumulation of heavy metals in their bodies could also be related to the births of children with malformations saw in the community . The seriousness of the Caetité River's pollution to the indigenous communities was immeasurable and strengthened the position that the mine should be paralyzed. The persecutor Ubiratan Cazetta, of the Public Ministry of Pará (MPF-PA), who participated in the Public Civil Action against Vale, said: "The pollution of the river is not negotiable, we must find the cause and recover." . According to the anthropologist Lux Vidal, who has accompanied the Xikrin since the process of land demarcation: “You do not pay the death of a river with millions, it cannot be so. This has to stop (…). Because, if the river is poisoned, what are they going to do? This river crosses [the indigenous villages], they take bath in it, they drink from that water, they fish in that water, and their children play in the river. There is no adaptation to such a thing. There is none.” . 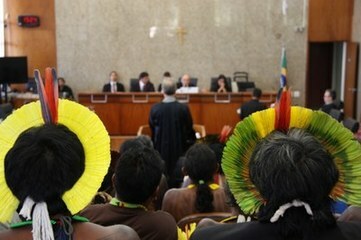 Since 2015, the Federal Court ordered the interruption of mining activities in Onça Puma several times, as well as the payment of 300 thousand dollars per month for each indigenous community affected by the operations. Vale argues it has respected the environmental licensing and denies that Onça Puma is the polluting source of Cateté River. Vale holds illegal mining and agriculture in the region responsible for pollution instead. Onça Puma's operations have been paralyzed on some occasions, but Vale has maintained nickel processing by claiming that the interruption order was only related to mining. In 2017, the Judge Souza Prudente even demanded that the gates of Onça Puma were sealed and that the police force be used if necessary, since Vale has not suspended the activities as per the previous order. However, Onça Puma is still in operation due to injunctions obtained by the mining company [8, 9, 10, 12, 13]. Project Details The mine is expected to extract 220 thousand tons of ferronickel per year and 27 thousand tons of nickel per year. About 95% of production is destined for export. The main buyers are: China, Japan, Germany, Finland, Italy and United States. Why? Explain briefly. The indigenous communities have won several victories in justice, but Vale denies all charges and has obtained injunctions that guarantee the mining operations despite the orders to stop production. Ministério Público Federal. Ação Civil Pública com pedido de antecipação dos efeitos da tutela em face de Vale S.A, Mineração Onça Puma, Estado do Pará e Funai. Andre Casagrande Raupp. 02 mai. 2011. Vale. Relatório de Sustentabilidade. 2011. Mapa de Conflitos Envolvendo Injustiça Ambiental e Saúde no Brasil. Mineração de níquel expulsa pequenos trabalhadores rurais e povos indígenas no Sudeste do Para. 2018. Folha de São Paulo. União acusa Vale de invadir assentamentos. Eduardo Scolese. 29 de junho de 2008. Folha de São Paulo. Assentados afirmam terem sido enganados. Agência Folha. 29 de junho de 2008. Agência Pública. Nos tribunais, os Xikrin estão vencendo a Vale. Naira Hofmeister. 23 de outubro de 2017. Araújo, Otávio. Ourilandia: Colonos fecham estrada que dá acesso a Vale. Real Online, 05 out. 2011. Ministério Público Federal. TRF1 paralisa mina da Vale no Pará por danos a índios Xikrin e Kayapó. 14 de set. 2017. Agência Pública. “Não se paga com milhões a morte de um rio.” Naira Hofmeister, José Cícero da Silva. E de dezembro de 2017. Agência Pública. “A poluição do rio não é negociável”. Naira Hofmeister. 7 de dezembro de 2017. APublica. Quanto vale um rio? Cercados por minas da Vale desde a ditadura, os Xikrin enfrentam agora a extração de níquel a 3 km da aldeia e a presença de metais pesados no Cateté. Naira Hofmeister, José Cícero da Silva. 5 de dezembro de 2017.